To some, the concept of poetry seems foreign at best. Ambiguous to decipher, obtuse in other ways; it is a form of literature that is often misunderstood. On face value, poems can look like haphazardly arranged words simply disobeying the rules of structured prose. But when you dive into the sounds, the reader can often see poetry rooted in a rhythmic, repeatable patterns; song-like in its nature. Meter (or rhythm) gives poem structure, and one such metrical line is known as the Iambic pentameter. It is a very common convention that is used in traditional English poetry verses. To COUNT a CLOCK and SPEAK of TIME-li-NESS. 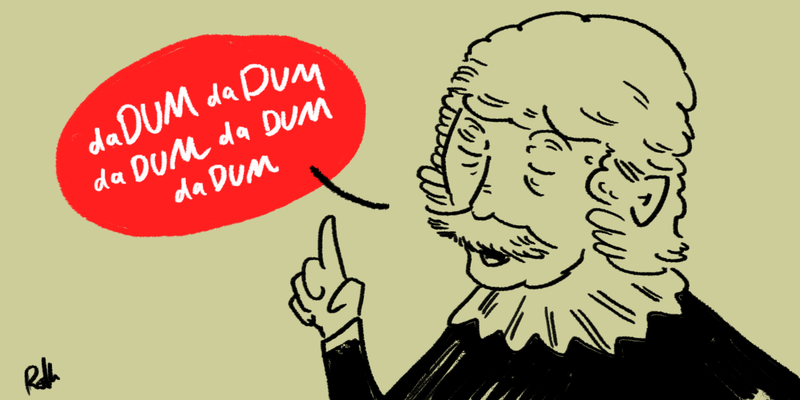 In reality, poets vary the iambic pentameter, treating it as a convention that can be played with. Like music’s time signature and tempo, poetic meter is rooted in the inherent musicality of humans speaking, transcendent of language and culture. Why and how did the Iambic pentameter come about? Theorists of meter explain that in the sixteenth century, English was a language that was still considered vulgar, commonplace and utilitarian. In contrast, Latin as a romantic language, was still considered to be the truest and most expressive language that literature could be written in. In Elizabethan-era England, Latin was the second language of every poet and many still wrote poetry in Latin rather than English. However, there was a great intent to develop a meter that would legitimise the English language to Latin’s lofty status. However, English differs to Latin in a fundamental way, in that it is an ‘accentual’ language. This means that ‘stress’ rather than length of syllable is the measure of the sound. There are very little short and long syllables of direct comparison between the two languages. Furthermore, Latin though revered, was a dead language, which made it hard to initially decode a meter that would sound right. Though the exercise in creating a rhyming system that elevated English would was arduous; such was the aspirations of greatness that characterised this era in history that the perseverance paid off. The Iambic pentameter was eventually created, and adopted freely by actors, dramatists, poets and playwrights who used it as a guide in many great works of verse-literature. ‘Serious’ plays were written in Iambic pentameter (also known as blank verse) — whilst stories that were there to provide quick entertainment and a pay-check was done in prose. The great poet Christopher Marlowe was the first to regularly use Iambic Pentameter to great effect and and elevated the verse form. Such was his profound command of this meter that he influenced Shakespeare in his own work, who in turn, mastered and played with Blank verse even more to inspire Marlowe in a virtuous circle. There are theories that linguists have expressed as to why the Iambic Pentameter length of line is suitable for English language poetry. Some academics claim that the length of a line is roughly equivalent to a human breath. About three quarters of all English poetry is in blank verse. Free verse, an open form of poetry that does not contain rhyme, meter or any sonic pattern, is a largely contemporary movement of poetry that is meant to imitate natural speech. Whilst it is accepted as a form of poetry or ‘spaced prose’, its form was largely rejected by esteemed poets who believed that some form of convention and rhyme needed to exist to facilitate the sounds of poetry. The presence of meter often gives poetry a structure, format and musicality that allows for its most truest reading. Iambic pentameter allows us to better appreciate the writings of classic and modern poets, whilst also allowing us to write our own. To leave with two examples of poetry of this meter, here is a selection of lines from Christopher Marlowe and by Alfred Lord Tennyson. See if you can hear the rhythm of the Iambic pentameter coursing through its sounds.